(1) Cycle counting is a procedure for breaking down a complex stress history into a convenient spectrum of cycles in terms of stress range A a, number of cycles n and, if necessaiy, R ratio (see figure 2.2.1 and 5.3). There are various methods in use. (2) For short stress histories where simple loading events are repeated a number of times, the Reservoir method is recommended. 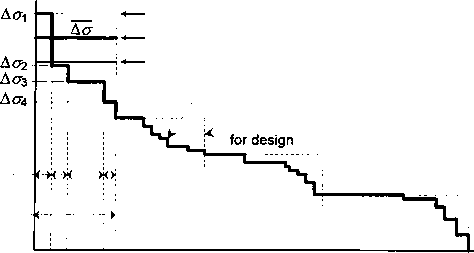 It is easy to visualise and simple to use (see figure 4.5.1). Where long stress histories have to be used, such as those obtained from measured strains in actual structures (see Annex C) the Rain-Flow method is recommended. Both methods are suitable for computer analysis. (1) The listing of cycles in descending order of A a amplitude results in a stress spectrum. 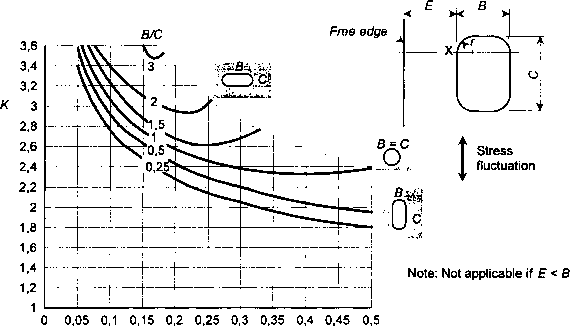 For ease of calculation it may be required to simplify a complex spectrum into fewer bands. A conservative method is to group bands together into larger groups containing the same total number of cycles, but whose amplitude is equal to that of the highest band in the group. More accurately, the weighted average of all the bands in one group can be calculated using the power m, where m is the inverse slope of the Aa-N curve most likely to be used (see figure 4.5.2). The use of an arithmetic mean value will always be unconservative.